Baia dos Porcos Beach, Fernando de Noronha, Brazil. Baia do Porcos also finds its name in the list of Brazil’s most beautiful beaches. Baia dos Porcos is also referred to as the ‘Pigs Bay’. This beach is formed by stones with hardly any sand, except on some narrow stretches. You have to make your way to this beach through these stone formations. Though the trek is difficult, it’s worth visiting. Baia do Porcos can also be reached by boat from the Cacimba do Padre beach but only during low tide. Whether you choose to reach this beach on foot or by boat, it is better to go along with a guide. Once on this beautiful beach which has many natural pools, you’ll be enthralled by the water in different hues and streaks and teeming with exotic fish in a variety of colors. 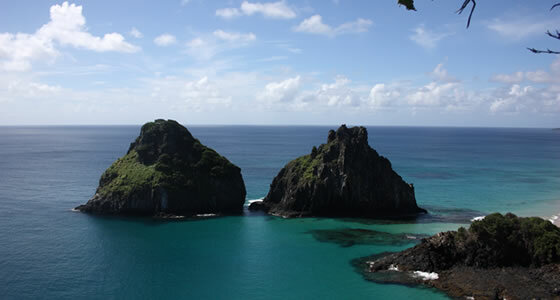 Baia do Porcos overlooks two huge rocks named “Dois Irmaos” meaning two brothers. The highest rock houses the ruins of Sao Joao Baptista fortress and also these rocks are great points to view the waters of Baia do Porcos which appear turquoise blue with dark stone cliffs looming large above the waters. The beach offers a picturesque view and absolutely no water sport, diving is strictly prohibited here.